Los Angeles, CA – Chucky is back! “A jolting roller-coaster of a ride” (Los Angeles Times), Child’s Play hit theatres in 1988, and forever changed the way the world saw dolls. On October 18, 2016, the SCREAM FACTORY™ home entertainment brand celebrates the landmark film and the iconic character with a 2-disc Collector’s Edition Blu-ray release which includes a brand new 2K scan of the film and hours of bonus material. 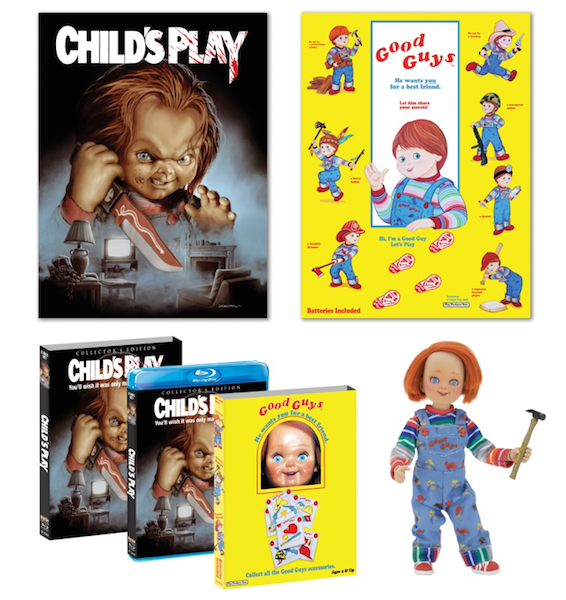 Scream Factory will also have a limited edition set offer complete with an exclusive poster, slipcover and “Good Guys” Chucky action figure from NECA available for pre-order on shoutfactory.com beginning July 7th. Since its release, the killer-doll film, alongside its synonymous character, has proven itself one of the all-time horror classics, and Child’s Play is now offered as a definitive, two-disc Collector’s Edition Blu-ray. More exciting special features are currently in progress and will be announced soon at a later date. – Receive a second custom-made “Good Guys Doll” slipcover—made exclusively for this promotion. NECA is the leading designer, marketer, and worldwide distributor of licensed entertainment consumer goods based on some of America’s most established and beloved properties, providing products across all consumer categories. Specializing in the 12+ licensed movie, video game, comic book, and traditional literary markets, NECA has over 60 licenses from major media partners for properties including Alien, Godzilla, Star Trek, Teenage Mutant Ninja Turtles, A Christmas Story, “Weird Al” Yankovic, and numerous other major properties from Marvel and DC Comics, major video game properties, as well as professional and collegiate sports. The NECA group of companies includes game developer and publisher WizKids, urban vinyl icon Kidrobot, retail chains Hastings and MovieStop, and full-service distributor SP Images. NECA is part owner of the Muhammad Ali estate and a partner of the Marilyn Monroe estate, and holds a majority ownership to Elvis Presley Enterprises, Inc., granting NECA the property ownership and management rights to Graceland, Elvis Presley’s home in Memphis, Tennessee, in partnership with ABG and the Presley family.